"There is usually a love interest behind it all, if you ask me," says Dr Maria de los Angeles. A sparky woman from Guines, not far from Havana, she is the director of the Cuban-Venezuelan eye hospital at El Alto, 13,000 feet up (3,962m) in the High Andes. It serves La Paz, the main city of Bolivia, which lies in a canyon 1,000 feet (305m) below us. We are discussing why a very small number of the 2,000 Cuban medical personnel sent to Bolivia from the island over the past two years have jumped ship and gone home. Her colleague Dr Mabel, an attractive young eye surgeon from Pinar del Rio, the western-most province of Cuba, agrees. "There's no pack of parties here," she murmurs contentedly. At the same time, both women fiercely agree about the worth of what they are doing, attending without charge to the sight of thousands of poor Bolivians, who otherwise would not be able to see. "Nothing could be more rewarding," says Mabel, who is on her first overseas posting, or "mission" as the Cubans call it. They add that it is not a bad career deal either. "We get our salaries paid in Cuba, our food and lodging is paid here, and we get some pocket money," says her colleague. We walk around her scrupulously clean premises with its well-stocked pharmacy, neat rows of free Chinese-made spectacles, and an occasional Che Guevara poster. Maria de los Angeles reflects on her time and on the years she spent among the indigenous peoples of Guatemala. "Until I went from Cuba to Guatemala and Bolivia, I didn't know what real poverty was," she says. The two surgeons are part of an ambitious medical and literacy programme here, and in many other countries around the world. It has brought the Cuban government immense benefits in terms of gratitude from beneficiaries and foreign governments alike. In a score of general hospitals built mainly with Venezuelan money over the past two years, 2,000 Cuban medical staff including 1,300 qualified doctors have been at work. In particular, Maria de los Angeles, Mabel, and her colleagues have carried out 200,000 operations in ophthalmological units up and down Bolivia. So popular are they, that the units built on the frontiers with Peru and Argentina have treated more Peruvians and Argentines than Bolivians. "We treat anyone who walks in, and we do it for nothing," says Maria de los Angeles. In the other Cuban hospitals in this country, services go from preventative medicine - which has pushed down infant mortality and pushed up life expectancy - to general healthcare and emergency operations. Then there is the joint Cuban-Venezuelan literacy programme. One hundred and eighteen Cuban and 18 Venezuelan trainers backed with texts and television sets have taught Bolivian teachers the best ways of getting people to read and write. At the Cuban embassy, the ambassador Rafael Dauza explains the diplomacy behind the scheme. "We give our services free, bring our own supplies and equipment, and don't take any patients from the Bolivian doctors. Our staff have been accused by those who object to our presence here of being careless and unqualified. But they have never been able to stand their objections up," he says. "And it is very difficult to attack a country that is giving free health care and education. One provincial governor who had opposed our presence here ended up having his life saved at one of our hospitals," adds Mr Dauza, with no hint of a grin. All of this has done nothing to calm fears at the US embassy, which looks askance at the Cuban and Venezuelan presence in Bolivia. A few days ago, the US ambassador Philip Goldberg had to apologise to Bolivia. It was established that an embassy official, Vincent Cooper, had tried to persuade a young US volunteer worker in the Peace Corps to spy on the Cubans and Venezuelans he came across. 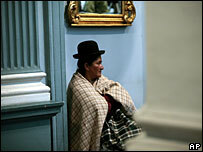 But Bolivian president Evo Morales declared Mr Cooper persona non grata. He has left for the US and will not be allowed back. For the Cubans, the recent Cooper affair was all part of a US strategy to tempt Cuban doctors to desert. US regulations allow Cuban citizens to enter the country with a false passport, or no passport at all. "We are the only people on earth with that privilege," says Dauza with a wry smile.